Settle in this is going to be a LONG one. There are sooooo many photos floating around, I will have to post more later. Special thanks to Amy, Chelsea and Jess for capturing the fun of the weekend..
We met Jill and Diana to carpool up to Seattle for the Expo. I LOVE Expos!! I really need to plan better so I have more time to just wonder around. I felt pretty rushed the whole time and like I did not get to see too much. -Meeting Cheryl at Razzyroo, she has soooo many awesome pieces. 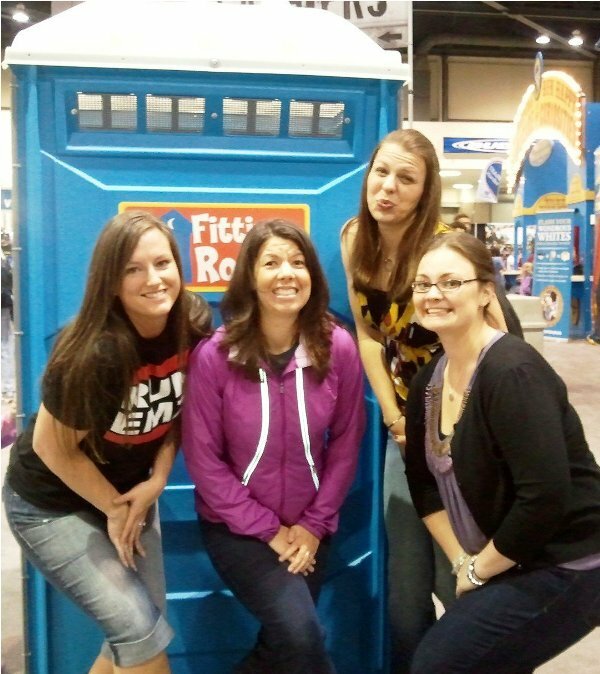 -Posing for a potty-inspired photo and WINNING the hourly photo prize through Brooks. 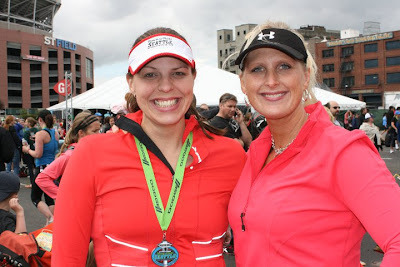 -Giving Chelsea HERE her ceremonial Tall Mom Half Marathon magnet, she did the miles so in my book she earned it!! 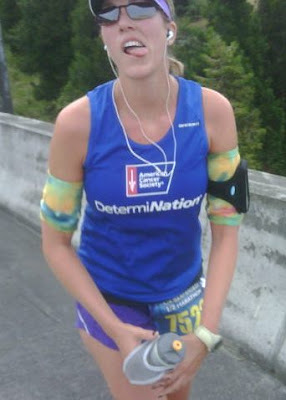 See Jane Run will make it race clock official. After the expo we headed to lunch at the Edgewater Hotel at Chelsea's idea! Props to Chelsea this was amazing, I did a little work for my Big Girl job, then settled for a nice lunch. The AMAZING folks at Onlineshoes HERE offered to sponsor our Bloggy Meet-up Swag Bags!! SCORE!!! Onlines shoes is GREAT, FREE Shipping, FREE Exchanges and 365 day return, go shop there!! We went to the loading dock to get the bags. Onlines Shoes made our Bloggy swag legit!! Jess and I got home and had a few minutes to refresh then we were back in the car. The traffic was GROSS!! Friday city traffic with 26,000 folks makes a BIG DIFFERENCE. I was stressing about being late, but there was nothing I could do. Jess got to hear me freak, I called Kerrie who was a bit ahead, that made me feel better. Jess was not feeling well, read the DETAILS HERE.. After a quick pit stop we were fashionable late. I was not 100% pleased with the space as one LONG table makes it tough to move around and talk, as an Event Planner I am HARD on myself for the little things.. But it was free for a large group, so we made it work. While setting up I saw Amanda and had to pause, a lot has happened the last few months and I needed a HUG from my good friend...She gives great hugs, we were both tearing up...LOVE HER!! I made a few Welcome remarks then we went around the room with introductions. I love love love meeting new people and spending time with my buddies. We had a GREAT group!! 33++ folks including a few spouses, race crew and kiddos. http://www.onlineshoes.com/ - AMAZING Gift Bags with a Puma Water Bottle, Clarks Travel Mug and T-shirts. Scape Suncreen HERE sent some samples that were in my mailbox the next day :( If you NEED Sports Sunscreen check it out, this stuff works, I battle tested it on a Marathon in 85 and did not get itchy or burnt. We ended at about 8:30PM and set out. I realized that there was a card in my purse…hmmmm… I opened it and it was from Chelsea thanking me for being her coach with an amazing gift card for relaxation. Her words and sentiment made me CRY! So I called her, she and Jill were being silly in the parking lot so I hopped out to give her a thank you hug.. This is what happened.. 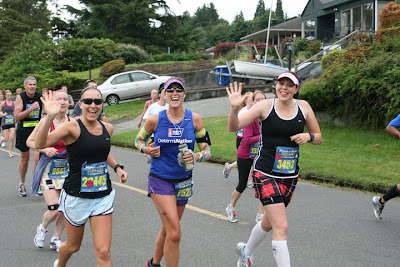 The moment I found out that Amanda HERE was coming to run Rock N Roll Seattle I knew that my only goal for the race was to be her lead/shadow for 13.1. I have found in my short racing "career" that I enjoy the races I have run WITH my friends a million times more than racing for PR Glory. Yes I can go fast, but what is the point when I cross the Finish Line alone?? Then have to wait for others. 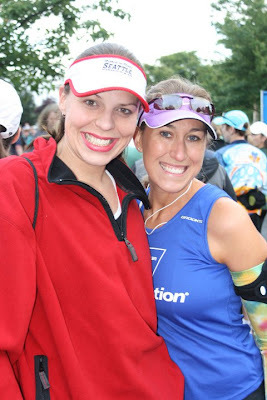 I didn't care about the pace or Finish time, I wanted to enjoy with my dear long lost friend. We all met up to carpool, Amy had her camera and snapped our picture. Kasey HERE came back for the race too!! It was fun to be with Kerrie and Zoe before their first race and I LOVED meeting Christine. My Mom gave me a bag full of toss-aways, not sure if this was my Brother's or Dad's but it was a XXXL and was totally cozy!! Thanks Mom!! 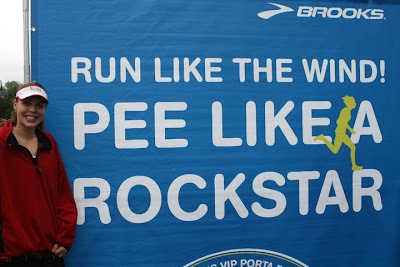 I love the Brooks HERE VIP Potties.. so easy to Run Happy when you don't have to hit the stinky Honey Buckets. Jess moved up a few corrals and I moved back, the 3 Chicas together in Corral #7. We planned a Pre-race Bloggy photo, last year Corral #6 was a great spot….well they moved the Corrals.. UGH!! I felt so bad #21 was now where #6 was and all my Bloggy buddies had to fight a crowd to get to 6.. FAIL!! We were a little behind the 6:30 schedule, sorry to anyone who missed the photo!! I was surprised to see how many folks still made the effort.. Thank you!! LOVED IT!! 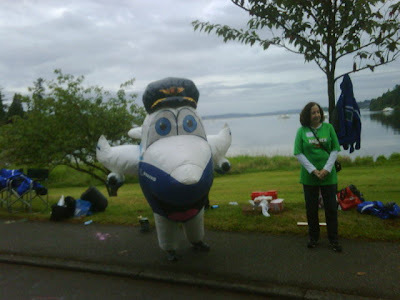 I got to meet Clint from Daily Mile and EMZ was there on her way to her super-speedy Corral. Coach HERE, Alma HERE and Shelby HERE added to the fun. We settled in to the back of #6, oops and off we went. Amy and Chelsea would be on the course cheering and taking photos, thanks ladies!! I loved having people out there to cheer us on. -A Goat Couple sitting in Lawn Chairs with coffee Mugs, so funny, they were in character and even made "Baaaa" noises. -Flags and photos of fallen heroes made us all tear up. -Sign which read "That is not sweat it is your fat cells crying." -Spotting Chelsea and her crew with big smiles. -Feeling strong and taking in the sites, smells and excitement. -Keeping a Vibram HERE count, I saw 6 pairs. -People introducing themselves along the course. 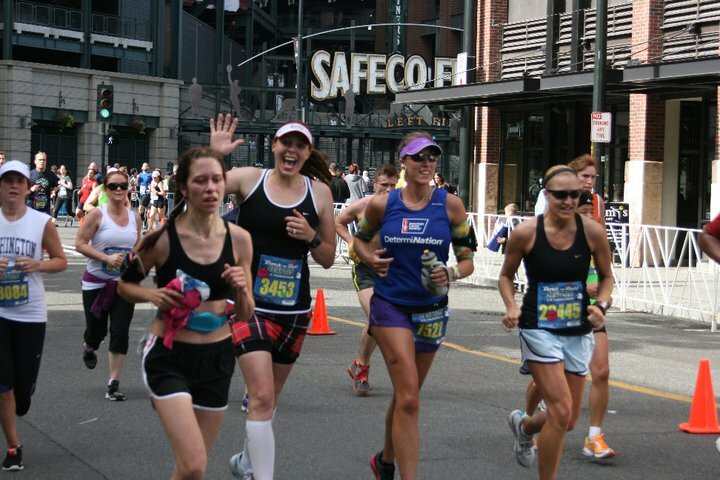 -All the Determination people cheering for Amanda and her amazing fund raising efforts for Cancer. -Taking a picture of Amanda sig pose mid race. -Taking a picture of the Blonde Ponytail bouncing in front of me. -Seeing the Finish Line and sprinting with my friends. -The Tunnel was HOT, I felt like my sweat gland were expanding and I could hardly breathe. It was loud and creepy. -Amanda and I were not wonderful on the hills, we tried to keep up with Jess. 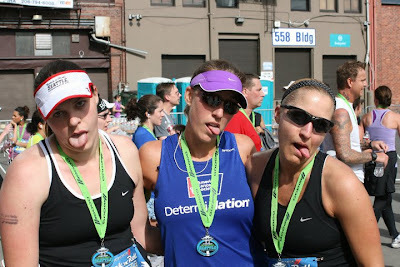 -Nearly puking just after the finish line for no reason?? 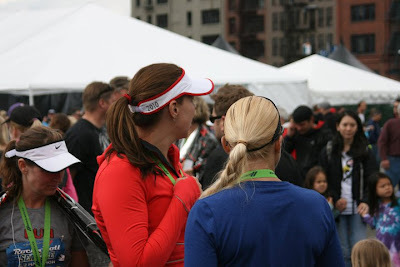 Having only run the Full Marathon in past years I did not know the excitement and CROWDS that are there for the Half Runners. It was busy!! 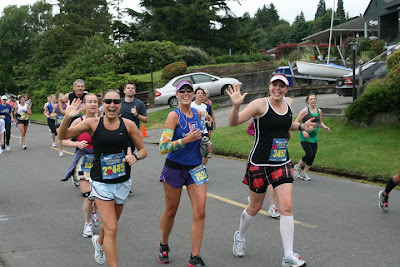 We Finished and found Amy, she had her awesome camera out and snapped a few photos, LOVE HER!! Then Jill HERE came and had a new PR, sub 2:00!!! Thumbs up to that.. We also saw the Speedy Jill HERE who had an impressive 1:35 finish. We grouped together for the photog and grabbed snacks. The plan was to set up camp at Family Reunion area B and we did. WE set out space blankets and made ourselves at home. Chelsea brought Oranges slices, bananas and my favorite, M&M's, love her!! We took pictures and bloggers and readers came by to say Hello. It was AWESOME. The down-side was poor Alma has a mid-0race injury and was not able to Finish, I was so SAD to see her face and dissappointment. She hid is well but I knew she was dying inside. Then there they were!! I rang Kerrie's Cowbell and we SCREAMED!! I started to tear up knowing the feeling of pride and accomplishment for my good friends. 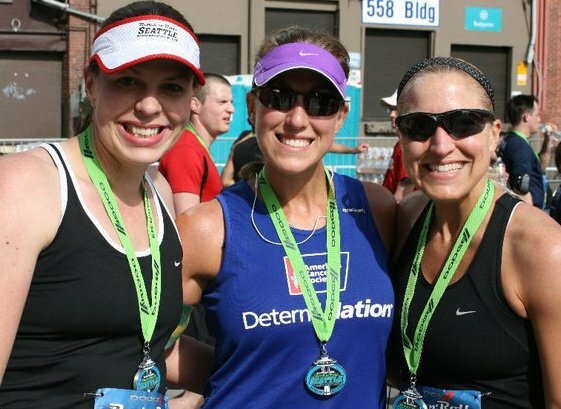 They ran every step of the 26.2++ together. We ran down to catch them and take a few more pictures. My heart was racing. Zoe looked so beautiful with her freckles shining. Kerrie was cool calm and collected, almost less tired than our lunch runs, which was pretty amazing!! More group pictures (WILL POST HERE SOON), family pictures then Zoe's family had to leave. I made it my mission to take care of Zoe because I know how nice it is to have someone take care of you after a race. We went to get her drop bag and she got asked about her Garmin, changed into Recovery Socks and Crocs and she ate some food. We hung around for a bit then headed out to Chelsea's car, As we walked I heard "Mel!!" Kerrie, who had just run a Marathon was sprinting after me because I had her keys.. FRIEND FAIL!! It was All over and the day was PERFECT… well not quite. Hi Mel...you guys all took great photos! I emailed you but not sure if it went to the right email. I live in Spokaloo (Spokane)... I found your blog about 2 weeks ago. 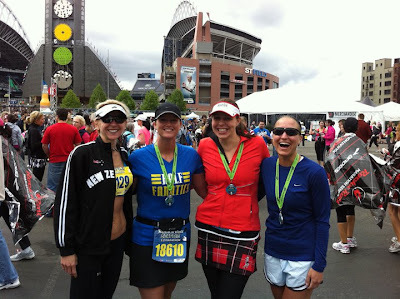 I follow Skinny Runner and I found Jess (Blonde Ponytail) from there and I found you through her blog. 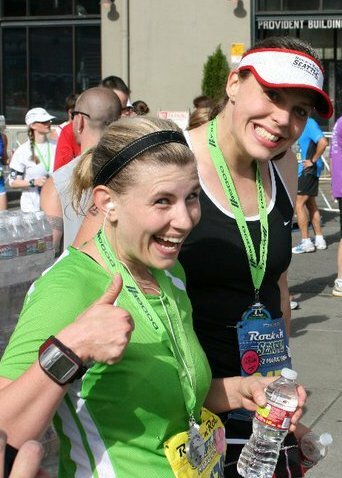 I know you've been here and had some meet-ups for some *running* etc...so the next time you're in town, let me know and we can meet up. I can give you my cell # privately. I teach at a local gym, too so mabe you guys can come in and take my cardio classes. I see that you're running See Jane Run as well. I'm thinking about doing it...not quite sure yet. I should just bite the bullet and do it. I'm giving myself overnight to decide. So happy to get to know some WA bloggers (finally)! What a fun post. So very proud of all you guys! What a FUN weekend! I big blogger meetup like that looks amazing! I can't wait for August to meet all of you!! First Q, since you are a See Jane Run Ambassador will there be a meet up for that? I am grumpy still I missed the photo op at least (and dinner). Second, OMG I Hate the I-90 tunnel. It is like a sauna, the air is musty...and it's just gross. Plus you lose Garmin connectivity... my strategy this year was to put on my most inspiring song to get through there. Holy crap - all the fun! I'm exhausted just reading it all! It would be so fun to meet up with so many bloggers and get some sweet gear. I must admit I am a little jealous. This sounds like such an awesome weekend! And LOVE the photos. Too funny. SO MUCH FUN! I have to admit, it is bitter sweet to read all of this. I am so sorry to have missed the fun. That was the best weekend last year. Glad you all had an awesome time!! Everyone looks HAPPY and that's what counts! Wonderful recap. Sounds like you all had a wonderful time! Thanks for sharing all the great photos. Congrats on another great race with friends. Sounds like you all had an awesome time together!!! 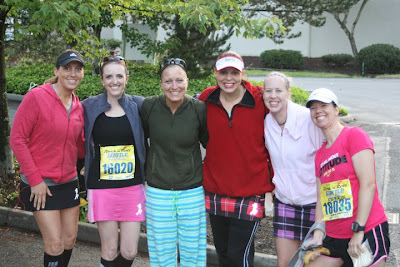 It is incredible that you were all able to do the race together and meet up!! Thanks for sharing all the fun pics!!! 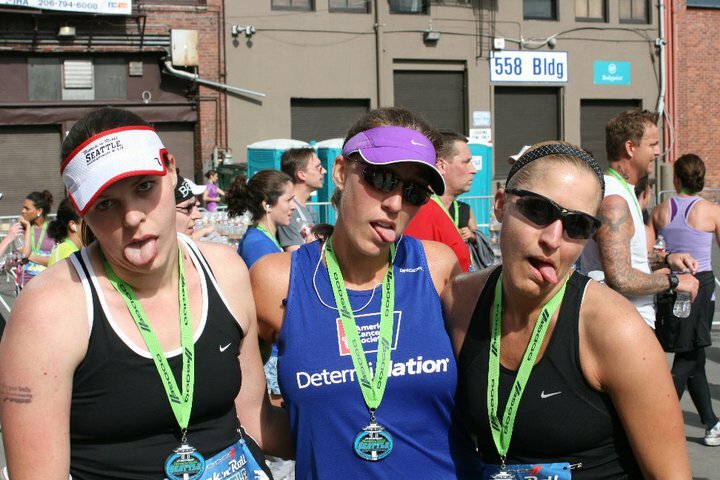 Wait, were you happy to NOT be running the full? Also, was Jess mean like me and did she facebook/tweet about your driving woes? Joking aside, it looked like a blast. I loved reading all about it. Can't wait to come see you! Less than 2 months!! What a great recap! 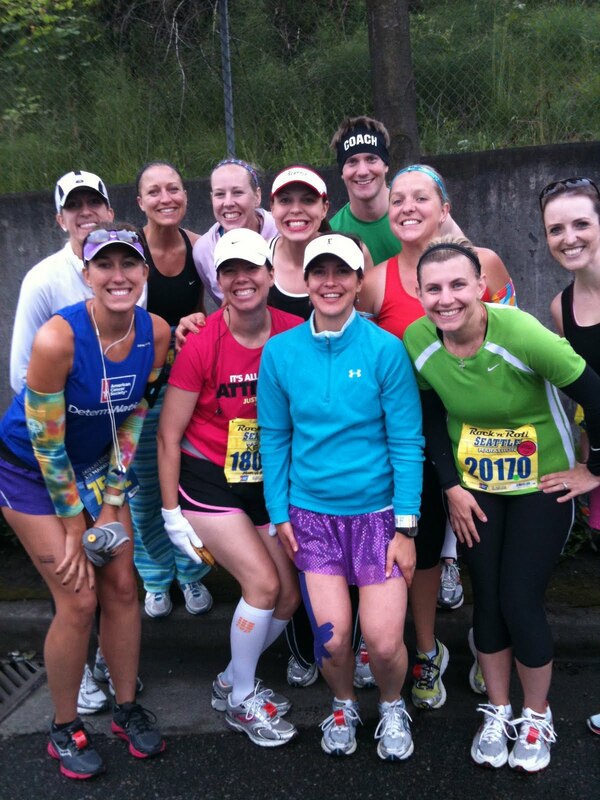 It was really cool meeting all of my favorite running bloggers in one place. I agree about the I-90 tunnel, its a little trippy in there. Thank you for organizing such a great blogging dinner! 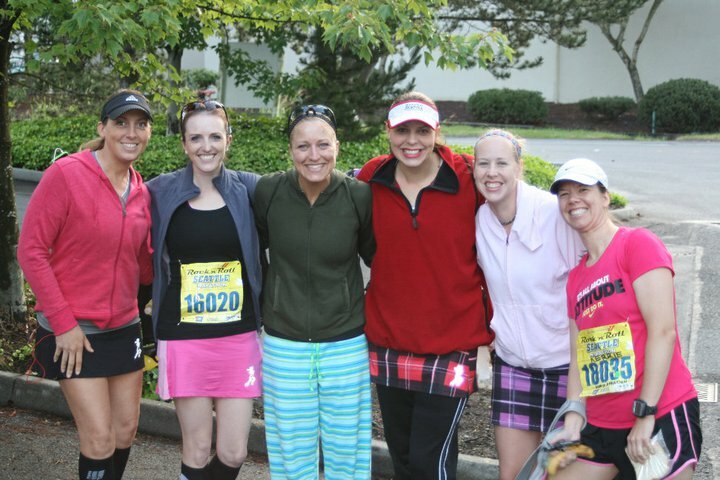 Looks like a great race when you get to run every step with some of your bestest friends. I am LOVING every recap from you girls and especially the pictures. Sole sisters rule! You have the best smile, Mel! Wow, after reading all of the recaps for this I am wishing I would have been there. So FUN! And what a group!! Loving all the pictures and stories. Hoping I can meet up with you all someday...especially since you're so close. Great pics! Looks like you guys had a total blast...awesome, awesome recap! That looks like such a fun time! 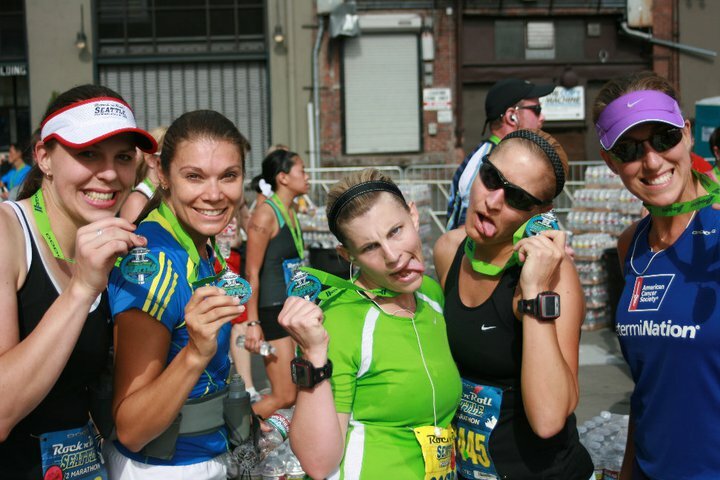 That's the marathon I would love love love to do someday. Missed ya - sorry I have been quiet. This looks like SO MUCH fun. Yea for meet ups! 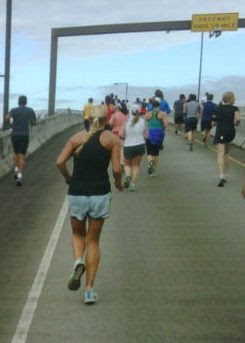 I ran today, so I hope to be back on the roads soon. Send healing vibes. If you have some scape, I would love to try it. It is hard to protect yourself on the bike! You are so good with the deets my tall, beautiful friend! I was SO HAPPY to run with you and Amanda and wouldn't trade a minute of it!! Truly a blessing. Thank you for putting forth an abundance of energy to make the weekend spectacular. You truly aspire to inspire. Definitely my "pay it forward" friend!